Words and pictures are the only things that last forever; they are more durable than the eternal hills. Beneath the deceptively prosaic and unadorned title lies a time capsule containing many things vital to the history of Penang. At long last, Province Wellesley’s rich historical legacy has been ‘unearthed’ and documented for appreciation and studies by present and future generations, in the newly published Sejarah Bergambar Seberang Perai. This much anticipated publication more than lives up to the oft-used phrase that a picture is worth a thousand words. History is subjective, and personal opinions and recollections reflect the changes that occur with the passage of time. Photographs, on the other hand, are truthful reminders of the past. From historical landmarks to workaday routines, one simple picture can unleash a flood of long buried memories and tell you more about the history of a place than any written story. This beautifully illustrated publication is the first of its kind. Drawing on meticulous and time-consuming research from local and overseas-sourced archives, the photographs and accompanying captions are both informative and spectacular. Production costs were funded via a Malaysian crowdfunding program called Mystartr – a roll call of the generous contributors are acknowledged in the book. 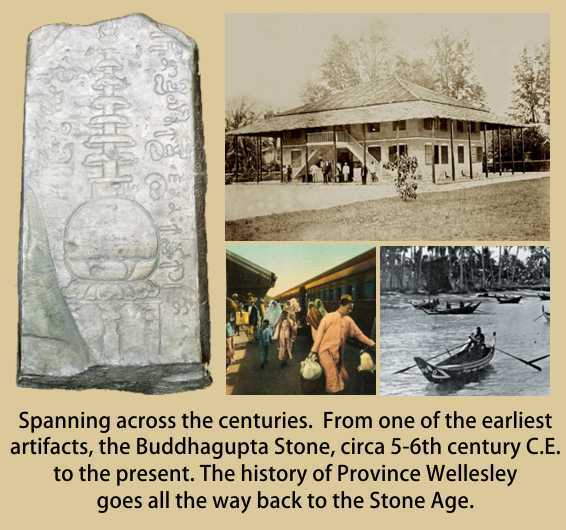 The author hopes that the over 200 images featured in this book will stimulate greater interest in the historical research and cultural mapping of Province Wellesley. The state’s heritage should be understood as an integral part of the history of Penang state as well as in the context of the development of the northern states of Malaysia. In view of the rapid economic advances and demographic growth, Province Wellesley’s history, traditional settlements, townscapes and cultural landscapes need to be identified and preserved, before they are lost in the urbanisation currents of the 21st century. The pictures in this book have been arranged into the following categories: Artifacts and Inscriptions; Farming and Agriculture; Butterworth; Rivers and Bridges; F.M.S. Railway and Channel Crossing; Multicultural Communities; Bukit Mertajam; Transport and Development, andMaps. Sejarah Bergambar Seberang Perai will be officially launched on 14 August 2016 in Butterworth, in conjunction with the annual Butterworth Fringe Festival. About the author: Khoo Salma is a fifth-generation Penang peranakan and an award-winning author/co-author of more than 10 books. She is a principal of Areca Books and custodian of the Sun Yat Sen Museum Penang. She is currently the vice president of Penang Heritage Trust. Her book The Chulia in Penang (2014) clinched the ICAS Book Prize 2015 – Colleagues’ Choice Award. Precisely what is So Fascinating Regarding Board of Directors?